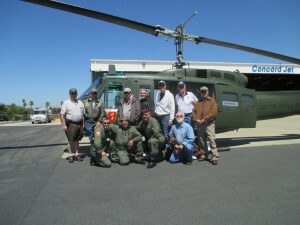 The sound and sight of a “Huey” helicopter elicit immediate memories of the Vietnam War. This association is for those who served in that War and for civilians as well. The reaction to the Huey is stronger for those who served, and is sometimes associated with negative, even traumatic memories. And yet, those that served are drawn to this symbolic and actual reminder of a very important time in their lives and the history of our Nation. When the Vietnam Helicopters group started operating the “25th Infantry Division Huey,” we reached out to the Vietnam Veteran community offering free rides to any Vietnam Vet who would want to go. The response to that invitation to fly was eagerly greeted by some, but with concern and reluctance by others. For those who took a flight with us, a positive change in their forty years of painful memories occurred. Vietnam Helicopters changes nightmares into pleasant dreams. The American Psychiatric Association in the Diagnostic and Statistical Manual of Mental Disorders (DSM) officially recognized Post-traumatic Stress Disorder (PTSD) as an emotional disorder in 1980. PTSD has probably been around since the beginnings of human consciousness and was especially noticed in returning warriors throughout time and across cultures. The war neurosis, shell shock, nostalgia and other variously named problems described in history, all reflected that which is now recognized as PTSD. When a person is faced with their own, or another’s death, particularly at the hands of another human being, the impact is horrifying. After the event, the vision, smell and sounds, as well as the emotions of the event may continue to plague the person’s thoughts. Naturally, the survivor will try to stop thinking about it and family and friends will encourage the person to “get on with their lives” or calm down by having a drink, or meet somebody new or work 20 more hours per week. The survivor’s efforts to not remember are repeatedly thwarted by a smell, sound or sight that occurs which kicks up that memory again and pain reoccurs. The brain/mind is designed to be aware and understand that which is capable of killing you and will not let go of near death experiences as easily as other experiences. One will always remember an encounter with death, some learn how to survive, while some live in constant vigilance of death’s return. A flight allows the memory to be softened. Therapists have been able to help warriors through the difficulties of PTSD through talk therapy methods including “de-sensitization.” This process involves discussing the traumatic event in a safe and trusted place to help the memory process into an event of the past instead of a constant recurring fear in the present time. This process often requires the description of the event to be repeated and thoroughly examined until the reaction to the memory is reduced. Some of the most current cutting-edge therapies in the Department of Veterans Affairs and the Department of Defense include computerized virtual reality reenactments of events that have emotionally wounded the warrior. These reenactments allow the warrior to practice changing the memory outcomes of the traumatic events. For some of our Vietnam Veterans, flying in a Huey does the same thing. We have repeatedly observed these changes occur even after more than forty years have passed, and even if only in a small way for the Veteran. However small, and however long it has taken, we think it is worth it. We are proud to be part of that healing. Looking for rides Illinois,Indiana area. Can i fly too with huey? I’m a Vietnam Vet who was in a lot of Combat, and I’d like to fly. Hi my name is William Barber I served in the Indiana National Guard at Winchester Indiana with the CO.B 1st BN, 293 INF 38th Div, after 3 years with this unit I retired after being out for 2 years I went back to the Guard and became member of the 38th Air Support and went to flight school and learned how to fly the Huey, Fast forward today I found out January 3rd of this year I was told I have between 3 to 4 months left to live well its getting close to my end I was wanting to know can I get a free ride in a huey one more time I would go and fly my own Huey but I sold it last month to pay all my Med Bills off, yes I am a pilot of a 1967 US Marine Huey gunship I have a picture of my bird on my computer, I have some Huey Patch, I would like you to have its my way of saying thank you to you for the ride and the pride of saving the Huey…..